Nobody needs reminding what a confusion of different dietary models there are out there – many shouted from the rooftops and vigorously promoted by authorities as varied as nutritional experts, the food industry, and young (usually female) vloggers selling the ‘clean’ eating message. One common feature of popular diets in the past few years has been the anti-carbohydrate trend, espoused by paleo eaters, Atkins diet advocates and many more. Carobohydrates have been blamed for a host of diseases – especially the steady worldwide rise in obesity. The problem with this reductionist approach is that carbohydrate at a category covers everything from a Dunkin’ Donut to a bowl of brown rice. The suggestion that refined white flour, cheap fat, loads of sugar and a host of food additives can upset healthy metabolism and lead to obesity isn’t surprising, but how absurd to assume equivalence with unrefined whole grains. Finally, a World Health Organisation commissioned landmark study has just been released which brings clarity to this debate and debunks much of the anti-carbohydrate argument. It’s one of the biggest and most authoritative pieces of dietary research ever published, using 40-years worth of observational and clinical studies covering 135 million person years. And the conclusion? Diets high in fibre found in whole cereal grains – as well as nuts, seeds, vegetables, pulses and fruit – dramatically reduce the risk of a wide range of diseases including diabetes, cardiovascular disease, strokes and cancer (with a 15-30% reduction in deaths from all causes), as well as leading to lower body weight and reduced cholesterol. 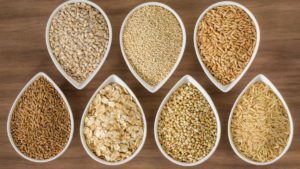 The study found that we should ideally be eating at least 25g of fibre a day, an amount reached by only a small percentage of the global population. Although the reasons that high fibre diets are so health-promoting may be complex, one candidate is the growing understanding of how indigestible fibre acts as a prebiotic – feeding the vast population of helpful gut organisms (the microbiota) which we now know is vital for many aspects of physical and mental health. The Lancet. “High intake of dietary fiber and whole grains associated with reduced risk of non-communicable diseases.” ScienceDaily. ScienceDaily, 10 January 2019. …isn’t there a large problem with these studies though? …that they confuse correlation with causation. If they’re looking at large populations and observe that the segment that eat 1g / day die of cancer much more often than the segment eating 20g / day… this is *not* evidence that eating 20g / day causes fewer incidences of cancer…though there is a correlation. It seems much more likely to me that the healthier people are eating more fibre because they are generally much more geared up and focused towards a healthy life-style and fibre is assumed to be a good component of that. Fibre may be healthy… but it seems a little unintuitive that something that is by definition difficult to digest would be of much benefit.